The intensity of the Volcano and the lava movement was far greater than I imagined, a real eye opener into how majestic the planet we live on is. The snorkelling off the coast of Kona was brilliant the best we have ever taken part in, we have been to many places but this one is top, dolphins even joined in. The deep sea fishing here is unparalleled, pacific blue marlin were the catch of the day! The sunset sails off the coast of Big Island Hawaii take you into another world of color and relaxation. 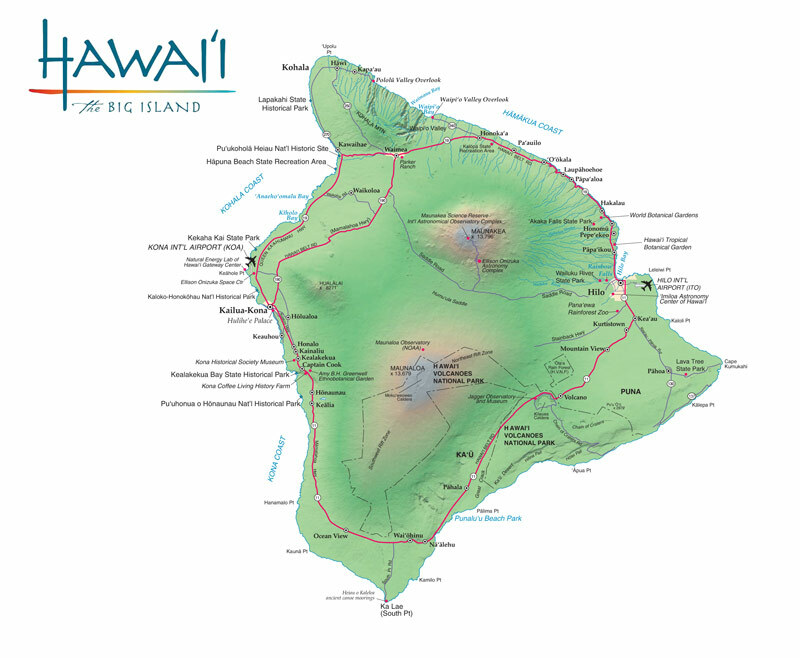 As its name suggests, Big Island is the largest of the Hawaiian Islands, and is the youngest. The volcanic activity that created the Hawaiian Islands continues to this day, constantly shaping and reshaping the island. Our customers return from Big Island praising its impressive range of resorts and hotels, suiting all tastes and budgets, its historic traditional towns and villages and the diverse range of natural environments, from the snow-capped volcanic mountains to the sublime beaches and warm tropical Pacific waters - There is lots to do on Big Island. Flying into Kona for your Hawaii holiday you will get a breath-taking view of the island from above, with the blue waters of the Pacific below. We highly recommend you book a hire car before you arrive on Big Island, thus allowing you the freedom and flexibility to explore the whole island with ease, and at your own pace. We can arrange this for you with our very competitive prices. One of the most popular attractions on Big Island is the Hawaii Volcanoes National Park, home to Kilauea, one of the world's most active volcanoes. Kilauea started erupting in 1983 and hasn't stopped since! At this World Heritage Site, witness the constructive and deconstructive power of an active volcano before your eyes. Returning to civilisation, the capital Hilo is a beautiful traditional Hawaiian town, home to centuries-old shop fronts, galleries, restaurants and historical and cultural sites. After all the excitement of exploring Big Island on your Hawaii holiday, you will be spoilt for choice with the number and quality of the beaches that make Hawaii stand out. Kua Bay just north of Kona is home to stunning white sandy beaches, crystal clear aquamarine waters, and is considered one of Hawaii Big island's very finest. Kahaluu Beach in the town of Kahaluu-Keauhou, often referred to as Snorkel Beach, is a fantastic spot for snorkelling with vast schools of colourful fish and Green Sea Turtles, an underwater camera is a must have! The beaches of the western side of the island are the perfect spot to watch the legendary Hawaiian sunsets, that will leave you with memories of a lifetime and determine you to return. To the south of the island in the foothills of the Volcanoes National Park, Punaluu beach is home to the distinctive black sand caused by volcanic lava rock running down off the hillsides. This is a favourite spot of the endangered Green Sea Turtles who share the beach with their human sun-loving counterparts. 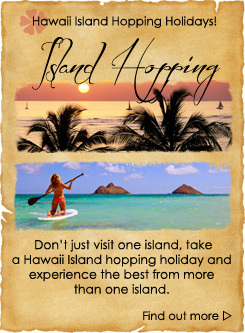 We have some fantastic special offers for holidays to Big Island - so don't miss out. Averaging at 27Â°C Hawaii's sub-tropical climate is consistent year round making it the perfect destination and giving you the option of travelling in any season. As you can imagine with such of lot of diversity going on in Big Island this impressive island is a draw for honeymooners alike. Luxury resorts and beautiful beaches make Big Island a fantastic choice for any honeymoon in Hawaii couple. As registered Hawaiian specialists, working closely with the Hawaiian Tourist Board, let Tailormade Hawaii's team of experts provide you with your dream holiday to Hawaii, with every last detail taken care of. Want to do something different? Then take a trip to Waipio Valley and 'Ride the Rim' for the most fantastic experience of a lifetime; the awe-inspiring panoramic scenery and breath-taking views will enchant you.